If you are looking for a winter adventure that isn’t skiing, look no further than snowshoeing. Snowshoeing is one of the great ways to explore the mountains, and can be done even in low snow conditions. Whether you are a novice or an expert, everyone can enjoy an afternoon on snow. Not only will you will see new terrain, you will also get a good workout. The benefits of snowshoeing are plentiful, but here are 8 of our favorites. The best part about snowshoeing is that the only qualifications you need is the ability to walk. Just the right snowshoes will make or break your experience, so be sure to work with a shop or guide service with top notch equipment. If you’re using a guide service, communicate any injuries or special considerations up front. Put idling cars in your rearview as you head out to the hills. You will only fill your lungs with fresh air and maybe the scent of pine and juniper if you are lucky. According to the Journal of Environmental Psychology, spending time in nature leaves one feeling happier, healthier and more alive. Second to the quality of the air is the quality of the quiet. Depending on conditions you might hear birds chirping or a small mountain creek babble. Keep an eye out for other wildlife like deer, elk and moose. You can customize your snowshoe experience to match your fitness goals. Are you looking for an ambling walk through the woods or do you have a need for speed? (Snowshoes built for running are available.) If it’s aerobics you’re after there is no shortage of mountains to climb! A set of trekking poles is helpful with balance and will also give your arms and shoulders some exercise, making this a well-rounded fitness activity. 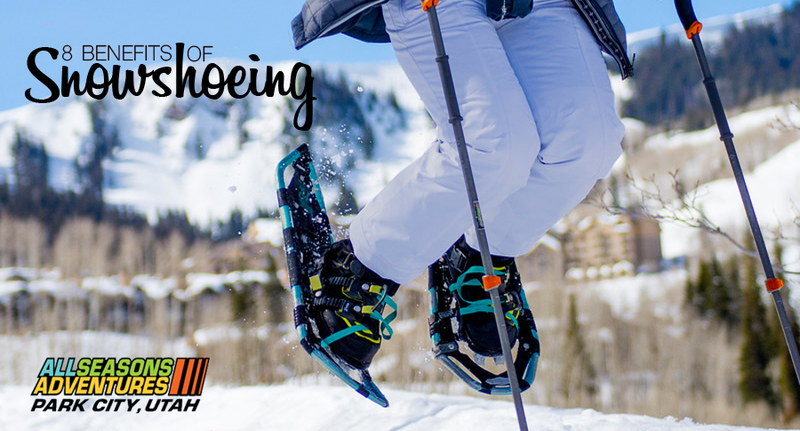 Experienced snowshoers will tell you that the best part of snowshoeing is the downhill because running downhill on fresh snow feels like you are floating. Charging downhill takes a little practice and balance, but it sure is fun. One of the best aspects of snowshoeing is that there is little impact to joints. That snow that you are stomping on acts as a buffer that keeps your joints well padded. Trekking poles will also help buffer impact to the knees and hips. Even if you do topple over, snow makes for a soft landing. Snowshoeing is wallet-friendly. Even with a snowshoe guide service, prices start at $39 per person. And with All Seasons Adventures, that includes s’mores! With these prices, (plus all of the calories you are burning) you can afford to splurge on a nice dinner. A bright moon or a headlamp can provide enough light to snowshoe in the dark. This is a great way to get some exercise after a long day. Our moonlight dinner snowshoe allows your group to enjoy the peacefulness of the great outdoors under the captivating full moon light of winter, followed by dinner at your favorite Deer Valley restaurant. Snowshoeing can take you places, a lot of places. The views and the solitude are more than worth the effort. Our tours span the Uinta and Wasatch ranges, and can include mountain peaks, beaver ponds, mountain streams or more of an urban feel, depending on what you’re after. For the first-time snowshoer, it’s best to get a professional opinion on where to go. Snow conditions are ever-changing and if you are unfamiliar to the area you should stay on designated trails. It’s a good idea to call your local guide shop for a trail recommendation that suits your fitness level and time frame. Consider going with a local guide if you want to go in the backcountry or more remote areas. Your next winter adventure awaits. Snowshoe like a pro and you will vacation like a pro!